“A ship in harbor is safe, but that’s not a ship's purpose.” said Cheryl Gleason, Administrator of KAY. Interpretation of this quote could be taken differently by many people, but to the members of the 2017-2018 KAY club it means, you will never reach your goals unless you test your limits. During this years KAY Area 3 Conference members were challenged to test their limits by trying new things in their own individual KAY clubs. 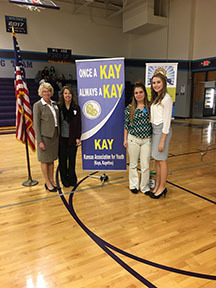 This years KAY conference was held at Nemaha Central on Friday November 3rd. Officers who attended from Valley Heights included President, Rosa Blaske, Jr., and Secretary, Hanna Yoder, jr. Sponsors, Marcy Manley and Kim Oatney also attended the conference. The purpose of the day was to gather new creative ways to spread service through living an emotionally healthy lifestyle. KAY members from Area 3 gave short presentations on how living an emotionally, healthy, lifestyle had impacted their school since August. While at the conference a new Area 3 President would be elected, four students from different KAY clubs around Area 3 were in the running including Blaske. Candidates had to have a nomination speech given by a member of their KAY club that lasts only 90 seconds. Following the nomination the candidate would give their two minute speech listing all the qualifications they had to become Area 3 President. After candidate speeches were given, each KAY club was given two votes to put towards any candidate they thought would be the best fit for president. While votes were being counted more leadership training activities were held for members. As the conference concluded, everyone gathered in the gym for the closing session. Members of the Nemaha Central KAY club went over what was accomplished during the day and Gleason, announced the new President. Rosa Blaske was announced to be the new Area 3 President, “I didn’t even know my name had been called only that everyone was looking at me and I saw Cheryl motioning for me to come down to the podium.” Blaske was inducted into the Area 3 Presidency by previous President Tiana Sothers from Pike Valley. The conference was concluded with many positive thoughts to make the upcoming fall and spring productive. “I can't wait to see what all we do in KAY this year, I'm very excited!” Said Yoder.